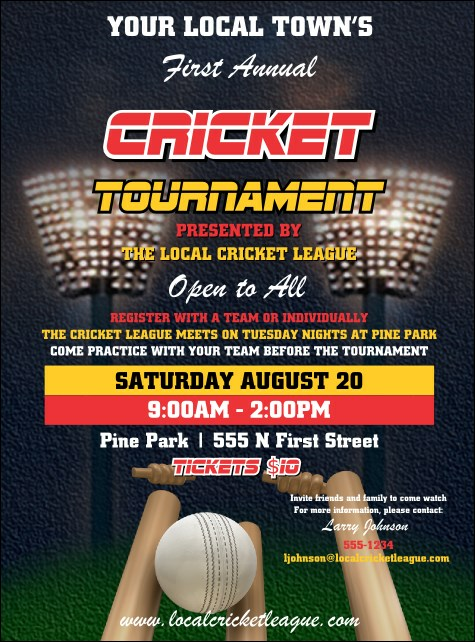 Make sure your event gets the notice it deserves when you use the Cricket 2 Flyer! This dynamic template will help details of your competition, tournament or cricket themed celebration stand out in bright letters on a blue and green background. Stadium lights and cricket paraphernalia let 20 lines of text pop. For any gala, gathering or game, find the right flyer at TicketPrinting.com!